Over 9,000? Oh heck yeah! Big RNA news inside! Hopefully by now you know that there has been a change in the weekly nail art link party over on the blog. It has now been extended a whole day due to many of your requests. The link party is open to everyone Thursday evenings through Sunday at 11:59 pm. More time to share for everyone! No matter what time zone you are in. 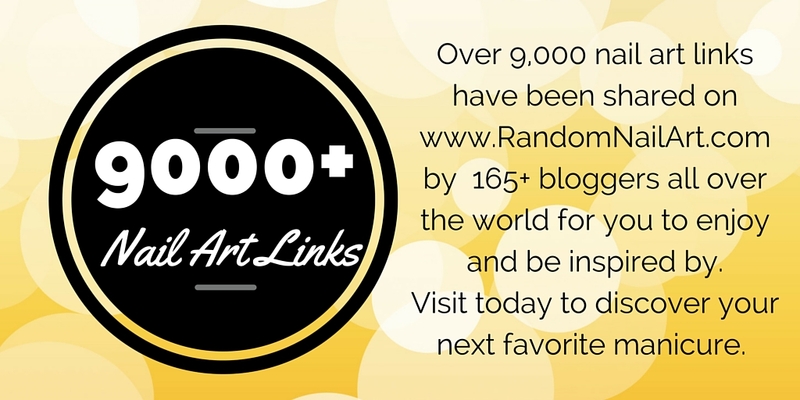 Random Nail Art has just hit 9,000 unique nail art looks from over 165 bloggers all over the world. How AMAZING is that?! With that exciting news, I am pleased to announce an even easier way to share your links with everyone in the Random Nail Art community. By clicking on the “submit your links” button on the RNA homepage, you will have the option to add your nails to a link up, just like any weekly nail art link party or challenge. This will serve as the holding ground until the links are uploaded. This will allow users to view the latest nail art that is so new; it’s not even in the site yet! And for those of you who didn’t know or weren’t sure: sharing your nail art on Random Nail Art does NOT take away any credit or traffic from your site. Your site will still get all of the traffic as though someone clicked on a link directly to your page. I don’t want other sites to take away traffic from my site, and I don’t want to take away from others. Site performance and speed are still on my “to-do” list, but I’m pleased with these growing pains. Thank you each and every one of you who visit, contribute, and participate within the RNA community and join us for the weekly nail art link ups. You are a rock star, and I can’t thank you enough for being part of it! As always, if you have ANY questions about joining in or have a fellow blogger you think would like to participate, please do not hesitate to contact me! I can’t wait to celebrate 10,000 unique links with you soon. Great news!! I wannatry this new feature! I think you’ll like it Sara, let me know if you think it’s easier! Wow that is soo great! 9000 lovely nail arts to discover in the community!